Check in (2pm onwards) at guesthouse reception at 37 Chapel Street. Follow main road into Cowes, 4th roundabout (Chapel Street - with clock in centre) turn right, 300m down the hill on right hand corner (Steele Street) is Holmwood. 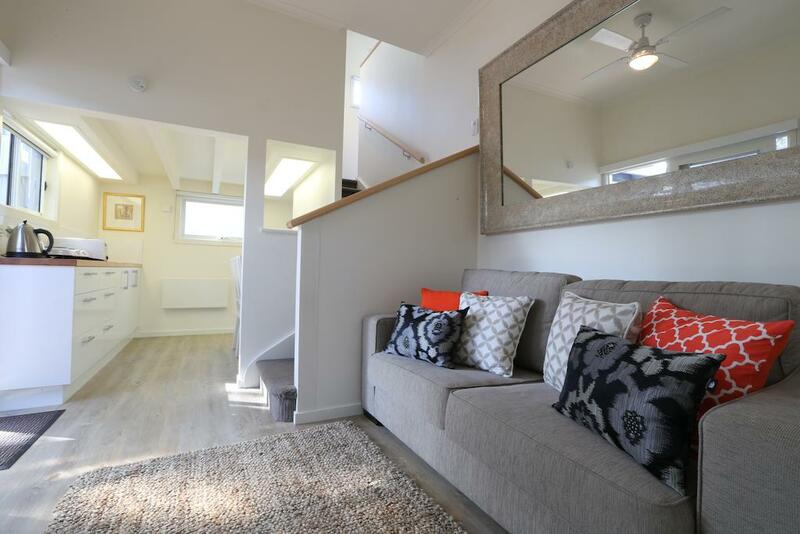 Multi award winning stylish retreat, offering traditional B&B in-house, contemporary self-catering accommodation in private and secluded spa cottages, or self catering studio loft apartment, all just 200m from Cowes' main beach. Location: Holmwood Guesthouse is a stylish boutique retreat set in a cottage garden in a quiet tree lined street, with three elegantly appointed rooms and two luxurious self-contained spa cottages, all just a five minute stroll from the Cowes main swimming beach, cafes and shops and just a fifteen minute drive to the Penguin Parade, Grand Prix Circuit and Wineries. 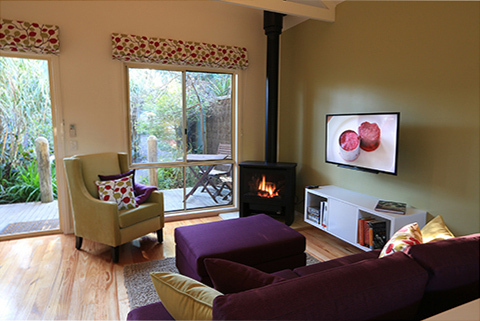 Property Details: Holmwood Guesthouse is a multi award winning stylish retreat, offering traditional B&B in-house, contemporary self catering accommodation in private and secluded spa cottages, or a self catering studio loft apartment. The Guesthouse was totally refurbished by new owners in late 2012, keeping the best of its original 1930's design while transforming the interior into a comfortable, stylish destination unlike any other on Phillip Island. 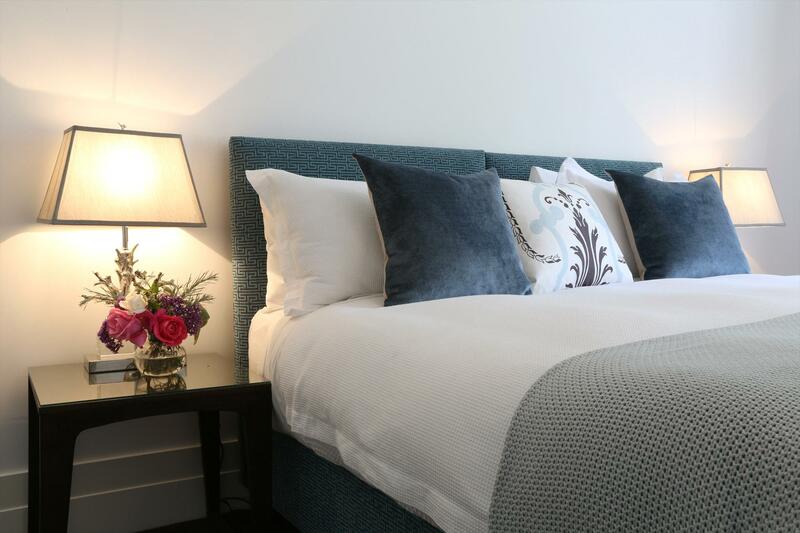 Our three in house guest rooms, The Verandah Room, The Garden Room and The East Room, are now more spacious and luxurious featuring brand new ensuite bathrooms, Free Wi-Fi, heating and cooling and coffee and tea facilities. The shared guest lounge was also expanded to add a cosy window-side desk for business travellers keen to finish the day's work before settling by the cracking log fire with a glass of Victorian wine. Breakfast at Holmwood is a gourmet treat and is included in the Guesthouse Rooms tariff. Bedding Configuration: Queen and King Split Beds are available, please check room description for details. Linen and towels are provided. There is a $20 surcharge if you would the King Bed made into 2 Single Beds. Booking Conditions: No smoking in the rooms. Pets are welcome in the Cottages and Studio. Credit card details are required on arrival. 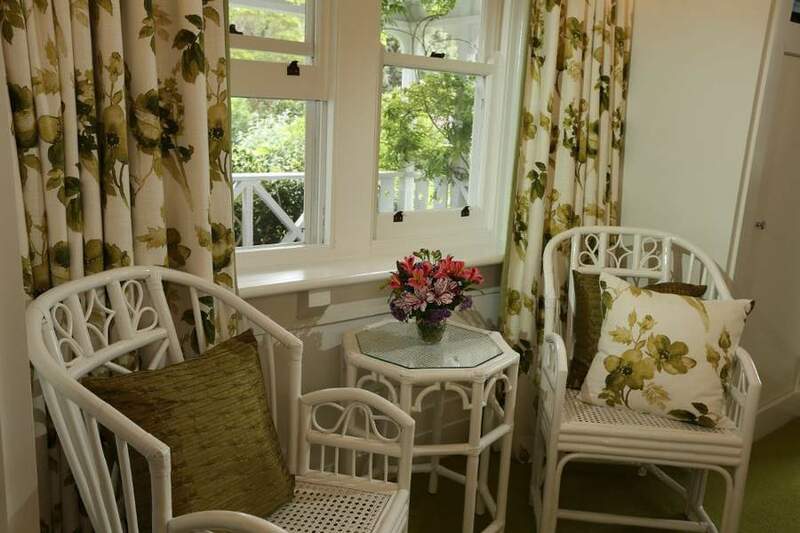 Holmwood Guesthouse and Spa Cottages is an adult only environment. Families with children are very welcome in our Seaside Studio loft apartment which sleeps 4 people in 3 bedrooms. The East Room features a king bed that can be reconfigured as twin singles (if you require two singles there is a $20 per night extra charge and must be organised directly with the property prior to arrival). The room also features reverse cycle air conditioning, TV, DVD, tea and coffee in room, bar fridge, private ensuite bathroom with shower, shared verandah, lounge chairs in room, linen provided, WiFi and Free Parking. Gourmet breakfast for two is included in the guesthouse tariff and is served in our balcony cafe or on the deck. The Verandah Room features a queen bed. The room also features reverse cycle air conditioning, TV, DVD, tea and coffee in room, bar fridge, private ensuite bathroom with shower, shared verandah, lounge chairs in room, linen provided, WiFi and free parking. Gourmet breakfast for two is included in the guesthouse tariff and is served in our balcony cafe or on the deck. The Garden Room features a king bed that can be reconfigured as twin singles (if you require two singles there is a $20 per night extra charge, and must be organised directly with the property prior to arrival). The room also features reverse cycle air-conditioning, TV, DVD, tea and coffee in room, bar fridge, private ensuite bathroom with shower, shared verandah, lounge chairs in room, linen provided, WIFI and free parking. Gourmet breakfast for two is included in the guesthouse tariff and is served in our balcony cafe or on the deck. The Luxury Spa Cottage standard bedding is for two people sharing a king bed that can be reconfigured as twin singles. If you require two singles please note there is a $20 per night extra charge and must be organised directly with the property prior to arrival. Totally self-contained, the room facilities include free WIFI, off-street parking right outside your front gate, HDTV with DVD, HiFi with iPod dock, broadband access point, split system heating/air conditioning, log fire, fully equipped kitchenette, and bathroom with spa bath. Landscaped individual courtyard with barbecue. Breakfast is not included in the tariff, but it is available in the guesthouse at an additional charge. Pets are also welcome. 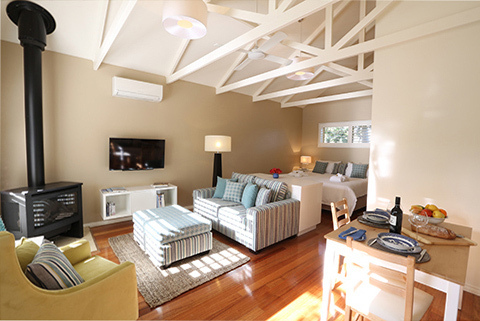 The Luxury Spa Cottage Inglenook includes a king bed that can be reconfigured as twin singles (if you require two singles there is a $20 per night extra charge, and must be organised directly with the property prior to arrival). The room facilities includes free WIFI, off-street parking right outside your front gate, HDTV with DVD, HiFi with iPod dock, broadband access point, split system heating/air conditioning, fully equipped kitchenette, and bathroom with spa bath. Landscaped individual courtyard. Breakfast is not included in the tariff, but it is available in the guesthouse at an additional charge. Pets are also welcome. This cosy split-level, three bedroom loft apartment, located right next door to our main guesthouse, recently fully renovated and now features a sparkling new bathroom, walk-in shower, heated towel rails, kitchenette, HDTVs, wall heaters, air conditioning, overhead fans, bedding and linen. Upstairs in the loft, there is a one double bed and one single bed in separate rooms, while downstairs another small bedroom sleeps a fourth person in one single bed. Linen and towels provided. The apartment also includes kitchen, two TVs (upstairs and downstairs), modern bathroom & toilet, wall heaters, air-conditioning, overhead fans, barbecue in private courtyard, Free WIFI. A small comfortable lounge room opens onto a paved, enclosed outdoor barbeque area. Parking is right outside the courtyard gate. Pets are also welcome in the cottages and studio. 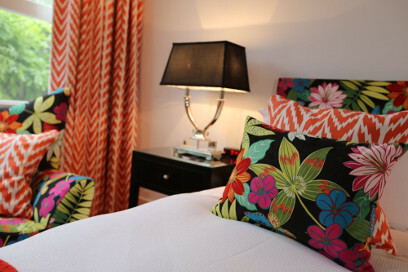 Cancellation Policy: Full payment and credit card details are required within five working days to secure your booking. Should you cancel within 14 days from the date of arrival we reserve the right to retain one nights tariff as a cancellation fee if we don't manage to re-book the accommodation. For group bookings of three rooms or more and Special Event bookings a cancellation period of 30 days applies. There is no refund for guests who do not show.